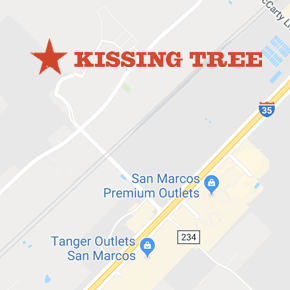 Kissing Tree encourages active adult living with a wide variety of fun and entertaining activities right here in the community. We also encourage residents to get out and explore other options just down the road from San Marcos. Here’s a quick list of our favorite San Antonio spots! Don’t miss out on the fun – it’s practically right at your doorstep. Stroll through the popular San Antonio River Walk. The River Walk is comprised of a number of quaint stone bridges, paved paths, and beautiful landscapes all along the San Antonio River. You will also encounter a variety of San Antonio attractions along the way, such as hotels, restaurants, shopping areas, boat rides, and more. You simply can’t live in Texas without taking the San Antonio stroll! Located in downtown San Antonio at 300 Alamo Plaza, you’ll find the historical Alamo, where a small group of Texans held out for 13 days against General Santa Anna to fight for Texas liberty. The site represents a crossroads in the history of Texas and is one of the most visited in the state, attracting more than two million visitors every year. Another top attraction in the area, the San Antonio Museum of Arts holds a collection of artifacts representing over 5,000 years of history from a variety of cultures throughout the world. The museum also hosts a number of educational art programs open to all ages, as well as a variety of other events. The museum is located at 200 West Jones Avenue. The Missions National Historical Park is comprised of four missions: Concepción, Espada, San José, and San Juan. These missions were constructed in the 18th century in an effort to expand Spanish influence to the north. The missions were each built as Native American Indian towns with the Catholic church as the town focus. Catholic missionaries came to the area and converted Native American Indians to Catholicism in an effort to assimilate them as Spanish citizens. The park also offers a number of other historical attractions, as well as nature hikes, bird watching, and scenic landscape. The park is located at 6701 San Jose Drive. The historic heart of the city is located in the San Antonio Main Plaza at North Main Avenue. The plaza was established in the 18th century to give the community a gathering place where people could enjoy each other’s company, as well as a variety of events and entertainment. Enjoy lush landscaping, shade-covered sidewalks, farmers’ markets, live music, and a number of other fun events throughout the year. The San Antonio Botanical Gardens offer 38 acres of lush and lovely landscaping for an opportunity to get close to nature right in the heart of the city at 555 Funston Place. The gardens feature a variety of exhibits and collections that include seasonal and formal gardens, such as a rose garden, a water-saving garden, a sensory garden, and a Japanese garden. Eleven acres of trails allow visitors to view more than 250 plant species representing three ecosystems. For an added bit of adventure, travel through an underground tunnel to the Palm House.